I have always known that plastic was a polluting problem that needs to be dealt with. I just didn’t know how bad the problem was until recently. Plastic can be a useful, convenient, substance, but it pollutes much of the earth and the oceans to a degree I didn’t realize before. Here are some horrible plastic statistics.Americans use 2 ½ million plastic bottles every HOUR. 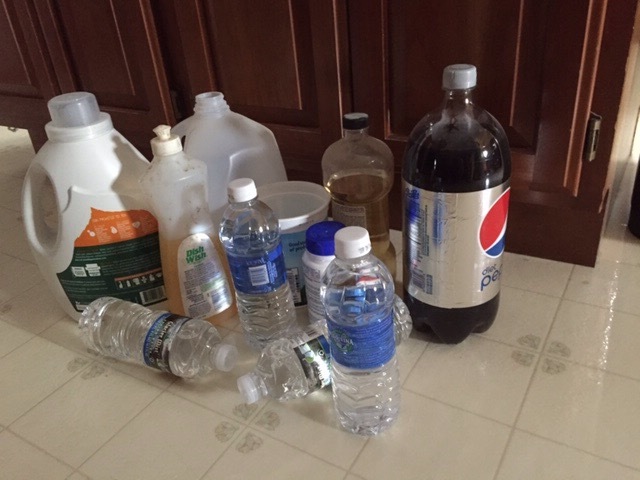 Only about 1/4th of all these bottles are recycled. Making all of these water bottles required the energy equivalent of 50 million barrels of oil. Think of all the pollution, in the form of Green House Gas, Sulfur, particulate matter, mercury and others, that is put into the atmosphere from the generation of all that energy. When thrown away as garbage and put into a landfill that plastic does not degrade for thousands of years if it is not exposed to the sun. If it is in sunlight it doesn’t decompose, it just breaks into very small pieces. The same thing is true if the plastic is dumped into a lake or an ocean. Small pieces of plastic are a problem because animals wrongly see them as food, and eat them. The PCBs and other pollutants become a part of the animal. This is an even greater problem in the oceans. There are huge whirlpool like areas in the Pacific Ocean, twice the size of Texas, that are floating trash heaps. A large portion of this plastic trash is made up of the ¾ of a trillion plastic bags used worldwide. 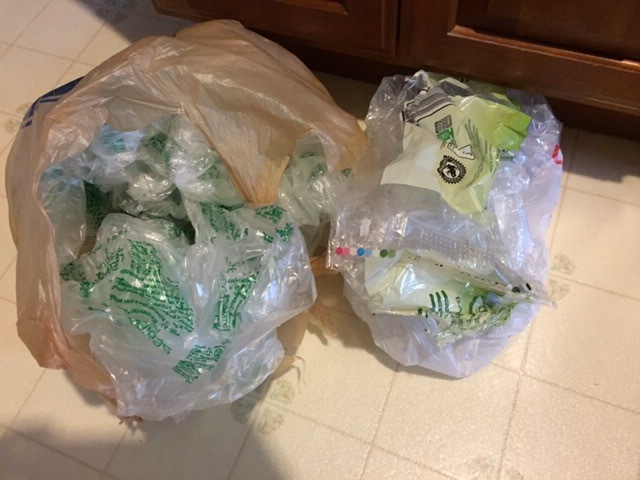 It is estimated that only 1 in 200 of these plastic bags are recycled. Plastic bags and other plastics are eaten by birds that think it’s food. So the bird can starve to death while having a full stomach, of plastic. The plastic particles from plastic bags, bottles, toys and other things are mistaken by fish as food, and eaten. When we eat those fish we are eating the plastic that they have eaten. The plastic even gets into tiny filter feeding marine creatures. Small fish eat these living things. Bigger fish eat the smaller fish, etc. Again we eat the fish and get the bio-toxins that is passed up through the food chain. Another plastic that is hidden from us are the micro-beads put into soaps to exfoliate our skin and into toothpaste to scrub our teeth. These tiny particles of plastic are so small that when they are washed down the drain to water treatment plants they are too small to be filtered out. So they end up in lakes, rivers and oceans and are consumed by tiny marine organisms. So eventually they pass up the food chain to humans. These horrible facts about plastics reinforce the great importance of recycling plastics, as well as other things. Take your own reusable bags to the store so you don’t need plastic bags. Don’t drink water from one use water bottles, bring your own drink or a container for the drink you need. Encourage your coffee shops to start using corn based cups or paper cups which can then be turned into compost. Finally, reduce the amount of plastic you buy and recycle what you buy.